Support our Prostate Cancer fundraiser on Saturday, 28th July. Wear something blue. Two shotgun starts - 7:30am and 12:00 noon with prizes for both morning and afternoon fields. It is an 18 hole 4 Person Ambrose/Stableford hybrid competition. If you don't know how that works don't worry it will become reasonably clear by the time you tee off. 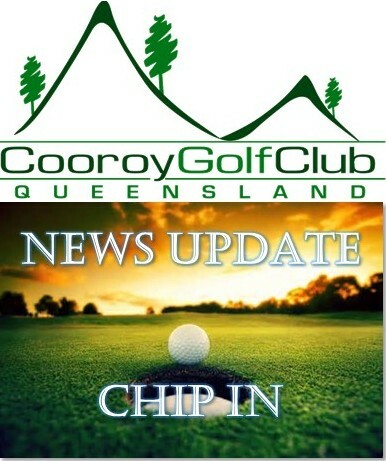 Cooroy host the North Coast Zone C Grade Championship on the 6th August. Our own Championships start on the 14th August, held over 4 days...14th, 16th, 21st and 23rd. Cooroy had success at the recent District Championships played at Noosa with Chris Michael and Assunta Easton taking out the Foursome Division 2 Nett title. It is with sadness that we advise the passing of our fellow player Colleen Sykes. Colleen passed away peacefully but unexpectedly. We are holding a Trivia Night at the golf club, on Saturday, 11th August, 6:00 pm for 6:30 pm start. Come along, have some fun and, test your knowledge. Tables of six, so get some friends together. Bring your own snacks. The cost is $25 per head, which includes dinner and great prizes. Get in early and book your table at the bar. While you are enjoying the hot chips in the clubhouse on a Saturday after the game, take a look around at all the little improvements that are being done by the volunteers..... cladding to the walls, touch up painting and new blinds. Thank you, John Cairns. Outlay $50.00 a year to BUY a BRICK and support major works on the golf course. 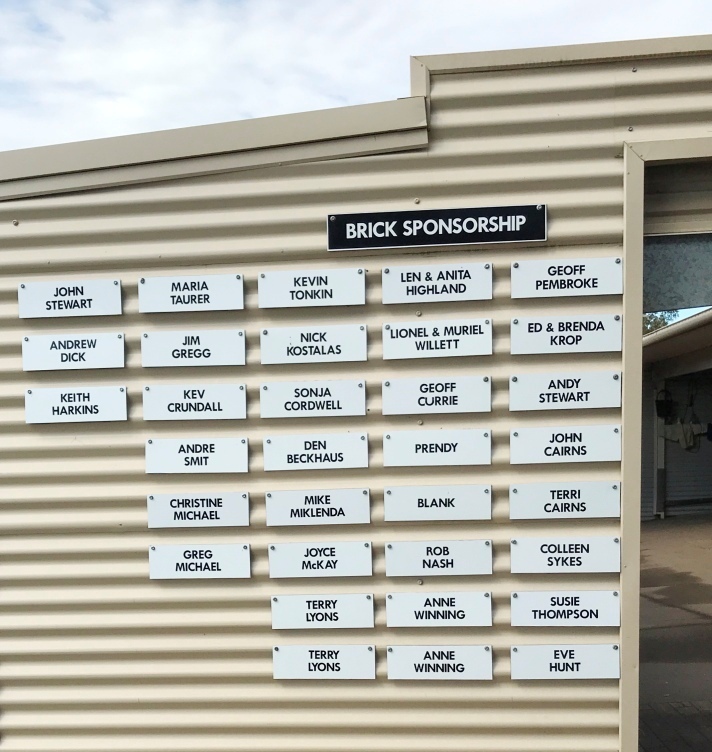 Your “brick” will be up on display on the hire cart shed wall. The bricks are selling well. We have raised in excess of $1600 so far. A huge thank you to all our wonderful supporters. A new Groundhog Aerator arrived in June. It is attached to the back of the tractor (second picture) and the slicer blades can be forced deeper into the soil by putting weights onto the tray. It has been heavily used already out on the course (tees and fairways) and Green staff are seeing surfaces drying out quicker and they are less compacted. A computer controlled fairway mower that utilises electric (alternator) powered reel drive motors. The mower reels follow the contours of the ground very impressively, and the mowing height can be set in 1mm increments. A Coring machine for greens, surrounds of greens and tees if necessary. Trees identified for removal have been marked with yellow paint. These are being removed for a number of reasons: aesthetics, safety, impacting on tee shots, to allow access by rough mowers and to reduce competition between trees allowing others to reach their potential. Others are being removed because they limit morning sunlight onto the green or are dead or have white ant infestations. Organisation and coordination of volunteer activities continues. A Volunteers Notice Board is now mounted on the verandah wall adjacent to the sliding entry door. We will hold a large working bee every three weeks or so to address the Greens Committee 'Wish List'. June and July have been particularly busy with a lot achieved. You can read full details in news FROM THE SHED. Equipment regularly serviced ensuring maximum up-time and allowing greens staff to be fully utilised on course activities. And, it contributes to greens staff morale. Weekly maintenance by our garden ladies ensures the gardens look magnificent. Stump grinding of some 90 stumps across the course. Raising the tree canopy continued: You can now look through from the 9th fairway to the 14th green. Left hand side of 16th fairway adjacent to creek. Rear right of 4th green. Tree branches at the back of the 16th tee removed to allow full use of tee block. Trees and undergrowth cleared from above pond on fence line in front of 11th tee. Mulch spread to cover black plastic on right hand side of 7th fairway. The upgrade to the 3rd bridge has been modified to cover all forms of traffic.